Simple French Door Curtains Easy to Make and Hang - Girl, Just DIY! If you have French Doors then you know how difficult it can be to find a good solution that doesn’t cost a fortune. 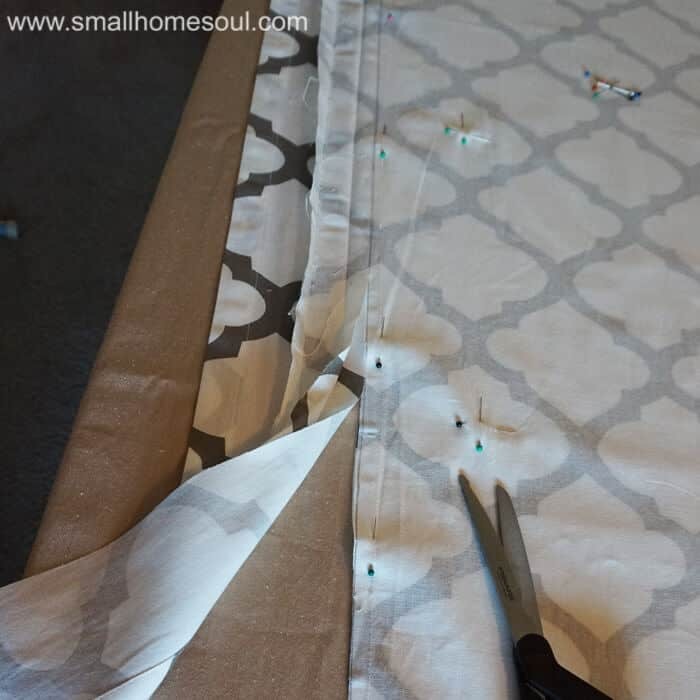 I’m going to show you how easy it is to make Simple French Door Curtains that will look great and save you a ton of money. You’re in luck if you’re looking for something other than mini-blinds or sheers that attach at the top and bottom of the windows. 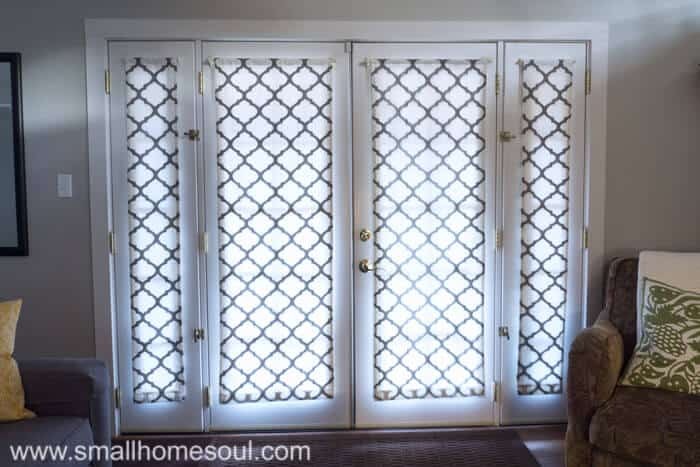 I like to see out my french door windows so covering them with a sheer or the door curtain panels that gather in the center will never work for me. 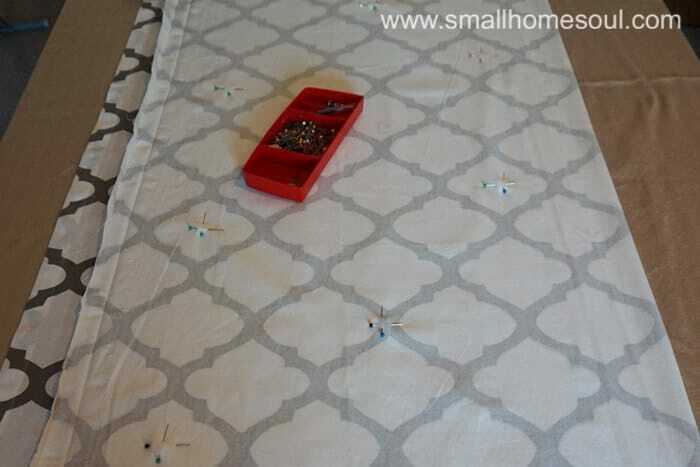 If you can sew a straight line, you can make these French Door Curtains. Curtains add so much style to a room but they can be expensive, which is why DIY french door curtains might be the perfect solution for you too. When we were broke newlyweds I made curtains from flat sheets that came with our comforter set. Sewing my own curtains over the years has stretched our budget when we didn’t have an extra nickel. I’ve purchased inexpensive curtains panels or valances for some windows over the years. Other times I sewed simple valances to cover tab top curtains. Recently I made lined curtains for my kitchen because the size I couldn’t purchase what I wanted. I’ve even done simple Drop Cloth Curtains on my patio. When it comes to french doors off-the-shelf curtain options are limited, or they’re a costly custom order. I’m not willing to spend the money to order custom curtains that open fully without a bunch of hardware attached to the door. The narrow sidelights make purchasing french door panels even harder. So I made some, using basic instructions I saw two decades ago. I’m so happy to show you how to make french door curtains for your home too. Drapery fabric comes in 54″ widths so if you’re making them double-sided 10 yards of fabric can get pricey. 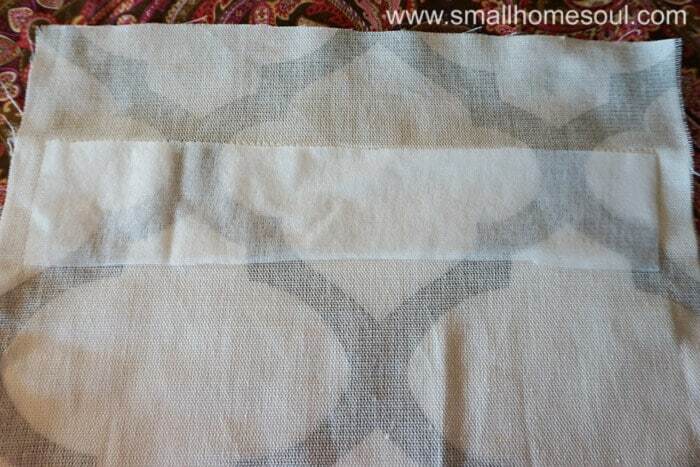 Pre-made curtain panels also come 54″ wide so I bought two sets of pre-made curtain panels for my fabric measuring 54″ wide by 84″ tall at $29.99/ea or $60. Fabric.com has a wide selection in a wide range of styles and price. I made my curtains double-sided so they looked nice opened or closed. Consider how much direct light your french doors get to determine if you need to worry about matching up the pattern from front to back. The pattern on the curtain panels I bought was easy to line up. You could also back them with a solid color if you choose. Below you can see the original french door curtains I made many years ago from basic directions in an article in Better Homes and Gardens magazine. Before Pinterest I kept torn magazine pages in a bulging accordion folder where they sat for several years before I got around to making them. The BHG article illustration called for rolling up the curtains and tying them with two ribbons attached over the rod. I modified their illustration and sewed trim in a loop onto mine. When they were closed the loop hung to the side (you can see it in the left of the pic below). They look great rolled up but honestly we ended up just folding them up and over the rod a few times which works great. There are lots of options for french door rods and the greatest majority screw in. But there are some magnetic options that work if you have steel french doors like mine. Because ours are steel I didn’t want to screw anything into the door so I chose magnetic curtain rods and they work perfectly. There are more finish options today so next time I might choose black ones. 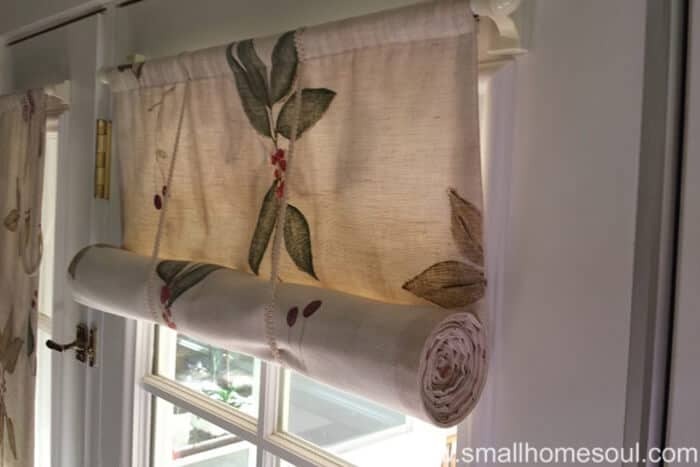 When I was ready to make a new set of french door curtains I followed the same basic instructions I recalled from the article since I no longer had my magazine clipping. The dimensions of my standard height French Door with Sidelights, on which all my measurements and instructions are based, are listed below. You may need to modify these instructions to fit your French Door windows if the windows on your doors are wider than mine. 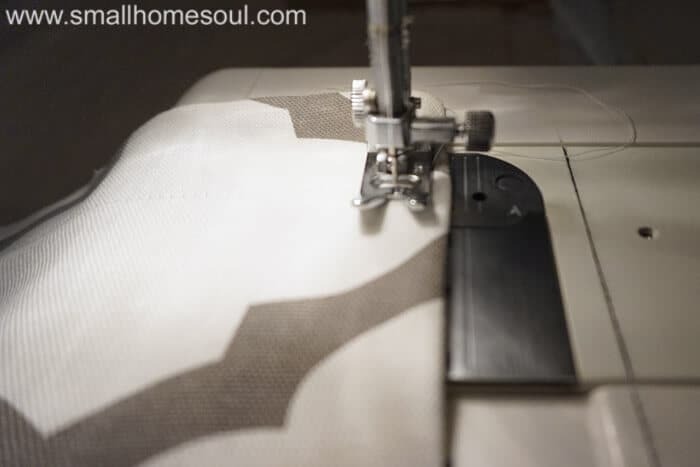 You should be able to cut these four sections from one curtain panel or one width of fabric, depending on the pattern. Read through the instructions fully and study the pictures before you begin cutting your fabric. I added 6-1/4″ to the height and 2-1/2″ to the width of each window. The extra length accommodates the rod above the window frame and allows the curtains to hang a little below the window frame. 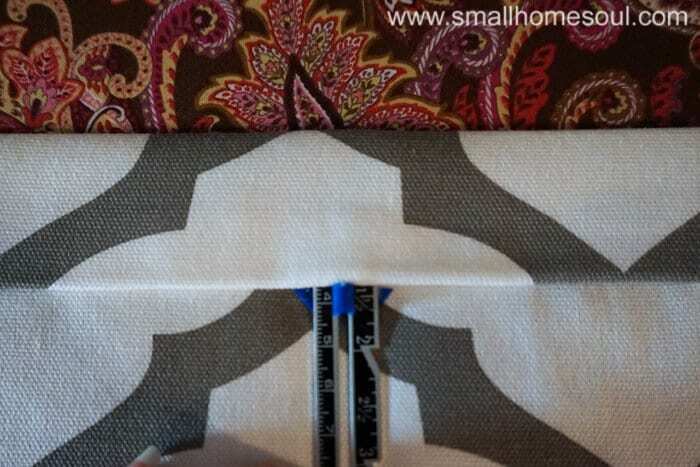 You can adjust the length to your liking before sewing the rod pocket (in the steps below). Each finished panel is approximately 68″ Tall after the bottom hem allowance and the top rod pocket. Work on one panel at a time following these instructions. If you’re using a fabric with a pattern pin the fabric together to align the pattern as I did below. For each panel mark the fabric in the dimensions above using the straight edge and pencil to ensure straight lines. Pin your panels along all edges before cutting as shown below. 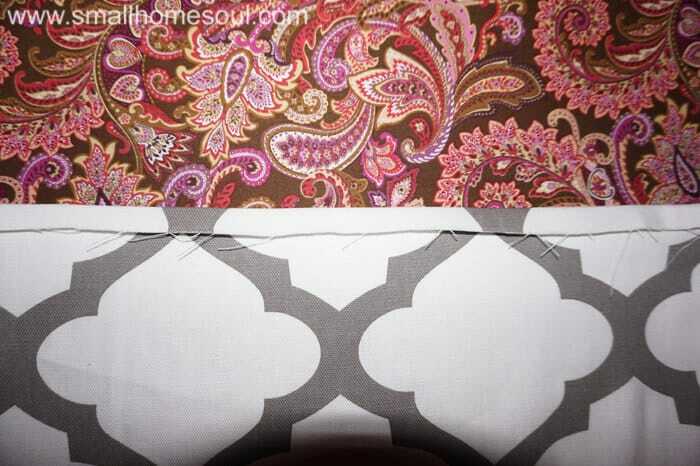 Follow these steps for all the curtain panels you need to cut. We’ll move onto sewing them together but first we’re going to add some interfacing for the hem. OPTIONAL – Interfacing will stiffen the bottom edge of the finished panel and help them hang nicely. This is an optional step that you can ignore if you choose. All other directions remain the same. 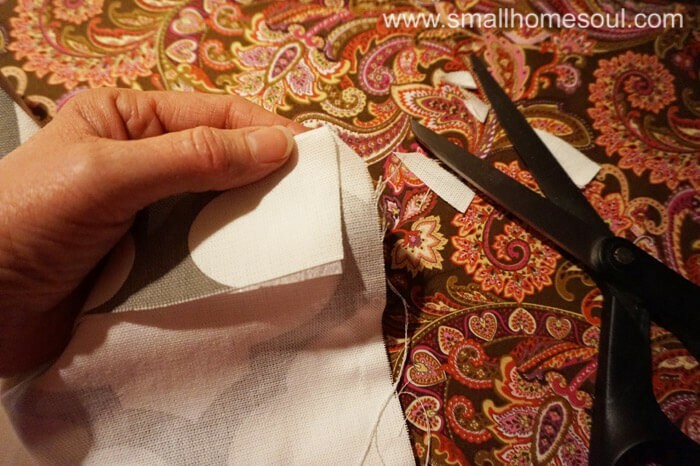 Cut a 2″ tall section of Fusible Interfacing the width of the panel you’re working on minus 1-1/4″. For the wider window on the door the interfacing would be 2″ x 23-1/4″. Iron it to the panel along the bottom edge of only one side of two pieces of fabric. Center it as shown below. Please don’t be confused by the poor example in picture below. The interfacing gets ironed to the bottom edge, I just took the picture to show it’s narrower than the panel of fabric. After the interfacing is fused to the fabric fold the fabric down 2″ and measure in 3/8″ from the edge and carefully snip the “corner” at an angle as shown below. This removes some of the bulk in the corner after sewing when you turn them right-side-out. 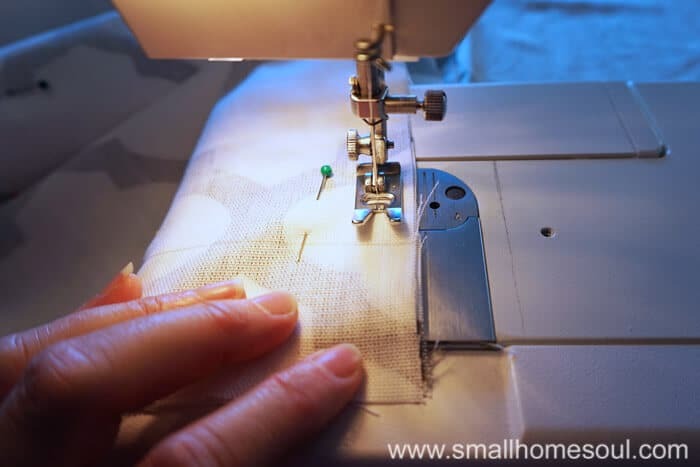 Sew a standard 5/8″ seam on two of the long sides and a 2″ seam on short side that has the interfacing. Leave the other short end (without the interfacing) unstitched. Turn the panel right-side-out and use the handle of a wooden spoon or another dull but pointy object to push out the corners. Work the seams out between your fingers so they’re even along the edges and press with an iron. Top stitch the newly pressed edges 5/8″ on the long edges and 2″ up from the bottom edge (with the interfacing) to put a nice finished edge on your curtains. The interfacing from the optional step is now sandwiched inside the 2″ hem at the bottom. You can just make out the bottom hem stitching in the picture below, to the left of the needle. Turn the rough edges of the unstitched top end down 5/8″ and iron. This is the start of the rod pocket. Using the Sewing Gauge turn down another 1-1/2″ (more or less depending on the rod you choose) creating a pocket for the rod. Pin every few inches. Top stitch 1/4″ from the folded edge above to create the curtain rod pocket. Repeat the process for the rest of the window curtain panels. When they’re all sewn slip the magnetic curtain rod through the curtain rod pocket and mount to the top of each window on your french doors. I prefer to use the magnetic rods on my steel doors but you could also choose a traditional curtain rod that screws into your door. If your door french doors are metal make sure use sheet metal screws. This is what they look like closed. The sun shining through thankfully confirms that I lined up the pattern nicely from front to back. To open them just fold the hem over the rod then fold them over one more time. Sometimes if I want the curtains open even more I’ll fold them a third time. Here’s a closeup of what they look like when they’re open. Are you ready to tackle making your own french door curtains? I know you can do it! But if you’re not into sewing, or you don’t have the time, you can also buy these I found at Walmart; I still prefer the looks of mine when they’re open versus any I’ve seen online. 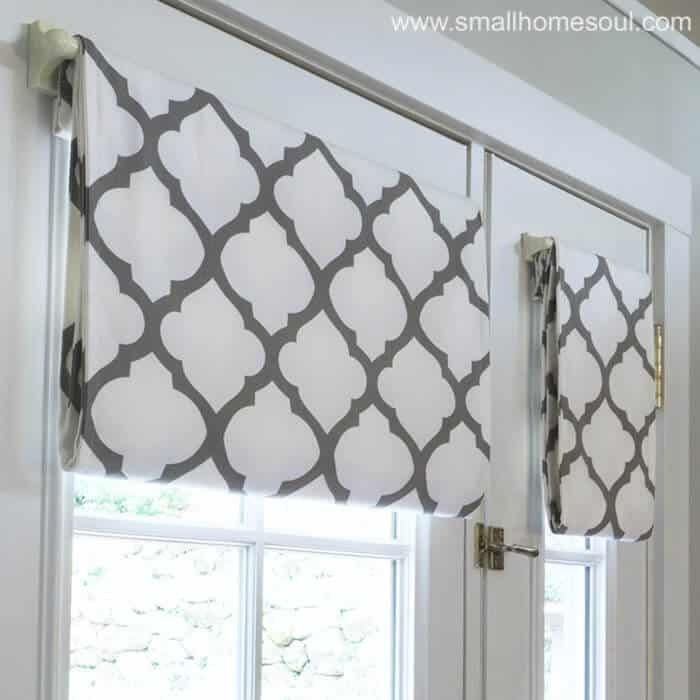 I hope you found this tutorial for simple French door curtains helpful and that it proves you can have beautiful french door coverings that don’t break the budget. I love the clean look of these curtains. Your instructions were clear, too. Holy cow what a great idea! I have two front doors with glass windows in VT that need a curtain and I hate the dated look of sheers. Pinned for soon when I can get this project done! Great tutorial! Toni! This tutorial is so perfectly written, you’ve got me wanting to run to buy some fabric for my French doors. I didn’t realize it was so doable. Thank you for all of the clear instructions and photos. You did a fabulous job! These curtain are beautiful and I love the pattern you picked! Perfect for the french doors, I need to keep this in mind for my new home I am building. These look so impressive when they are all drawn down Toni. I had french doors in Greece but had floor length curtains to cover them. Had I known this I would have chosen to do it this way. So much more stylish! Love the fabric you chose and how easy are they?! Such a fabulous idea! These look great and the tutorial is well done. Pinning. Brilliant Toni. I love how easy these are to make and how absolutely gorgeous the finished curtains look. These curtains are so pretty. I have a similar door and I thought that making curtains would be tricky. Thanks for the great tutorial so that I can try to make some of my own. 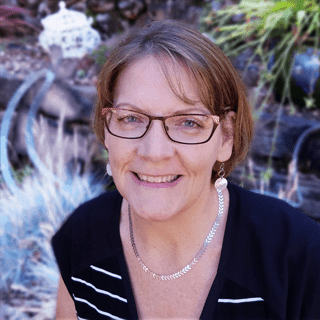 Thanks so much Susie, I really like that moroccan trellis and I lucked out finding it in premade panels. I hung a few more of the panels on the sliding glass door in my dining room. Thank you, when I make the new set I’ll post before and after pictures in that post. It will be very rainy soon and the perfect time to get in some sewing.